At the very, very tip of Anna Maria Island in the city of Anna Maria there is a street called Pine Avenue and located on this street, is the doorway out of earth and into heaven: Anna Maria Donuts. It has been rated 5 stars out of 313 reviews on Trip Advisor, holds the #1 Restaurant Position in Anna Maria Island and has received a ‘Mark of Excellence’ award for every year that is has been listed on Trip Advisor. This quaint, hidden gem lays nestled into a plaza disguised as a home at 210 Pine Ave and is surrounded by numerous restaurants and shops that are known around the world. 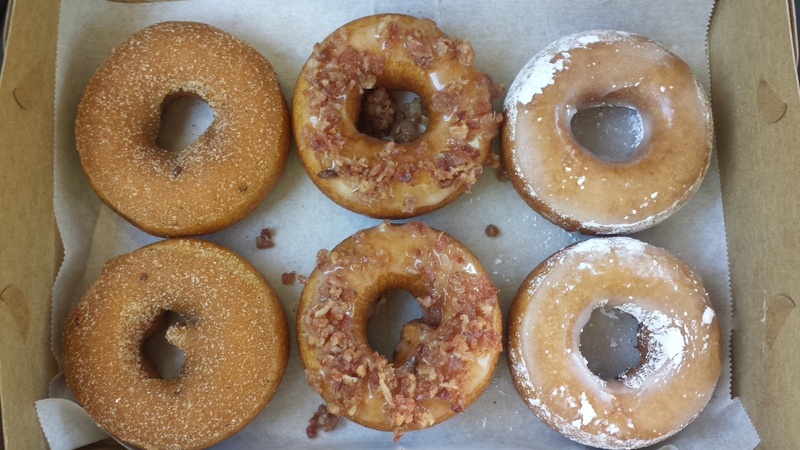 There is a good chance that you have never heard of Anna Maria Donuts and that should be a crime. After you’ve parked (and maybe passed the building a couple times) you will walk up to Anna Maria Donuts and into their simple and chic relaxing environment. They have been criticized for their choice in decor and seating options but when I go out to eat, I look to eat where the food is great, not the decorations and that is true for their treats. On their special board you will see that they also carry house-made coffee with their own signature recipes and daily blends. 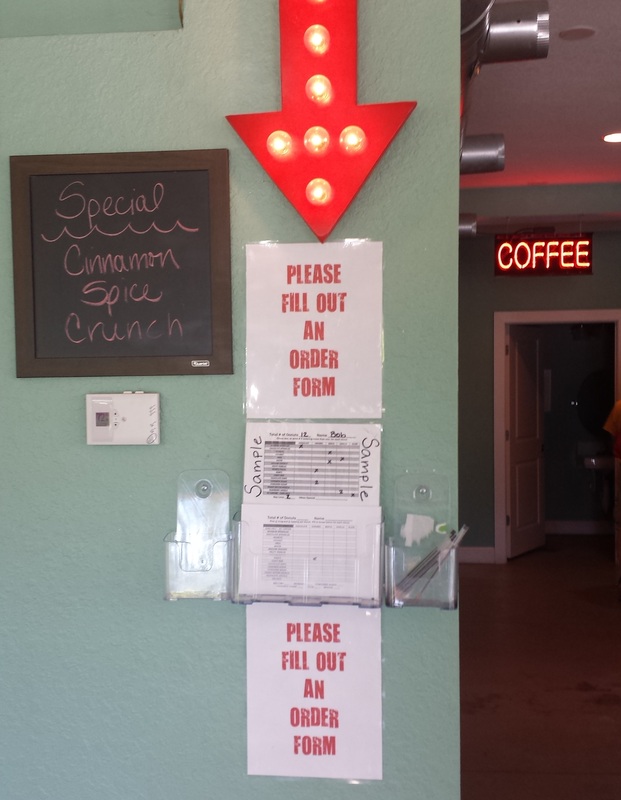 To order donuts, you need to fill out a simple form that makes the entire ordering process extremely easy and bring it to the counter with your name to then pay for your order. With over 75 different topping combinations it can be overwhelming to remember your order by reciting it to a team member. They came up with the order form system to keep organized and on schedule for season and during peak times in their day to day routines. Anna Maria Donuts is owned by a husband and wife team with only a handful of select employees that help them with business; one of the spouses is usually there working everyday that they are open. In their indoor eating and waiting area, they display art and photographs from local artists in the community that you can buy. Located only several doors down from the Island’s Art Gallery, they feel it is important to invest in the rich history and beauty which surrounds them by supporting local artists. This place knows how to make mouth watering donuts and provide great customer service. Once you have your donut and are looking for a spot to sit, why not consider the outside porch you passed through on your way to order? Having tried and tested this donut shop’s reputation as #1 on the Island, we can confirm that if you do not stop by here for a breakfast treat on your visit that you will never be truly happy. This restaurant takes a step back from the flashy business approach and allows them to focus on making simple and incredible things: donuts. 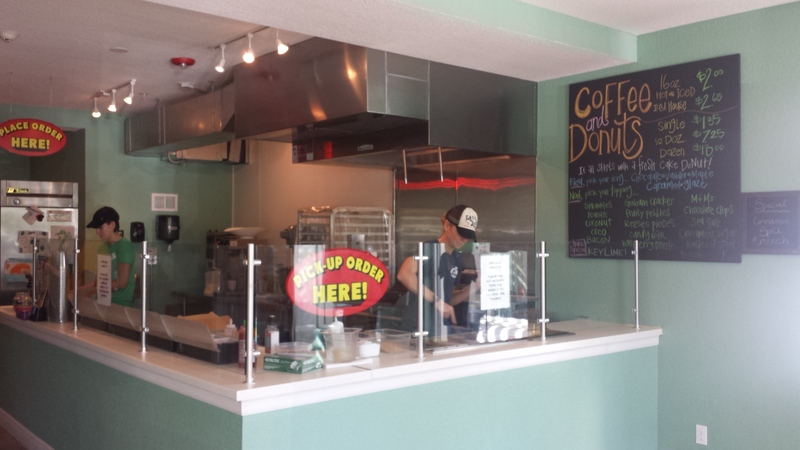 We give this restaurant a 10/10 on Anna Maria Island and confirm that this donut shop can hold it’s own as #1 on the Island.